Yesterday was a good, good day for me. I get to keep my boss – who I like and support – for four more years and my state passed two referendums that increase equality and opportunity for all. But Monday was also good for policy, albeit in a different, far more local way. On Monday, a representative from the League of American Bicyclists awarded my town a Bronze distinction as a Bicycle Friendly Community. The League had actually announced the award in mid-October, but Superstorm Sandy delayed the city presentation by a week. Obviously, there were more important things to do last Monday than fuss about with ceremonies. While Bronze may seem like the bottom of the stack, it was a big step up for Rockville. The city had applied to the program in the past and received an “honorable mention.” It’s nice for the League to recognize effort, but “Honorable Mention” doesn’t earn you a spot on the official list or a snazzy metal sign to hang in your town hall. Compared to a few years ago, we worked quite hard to earn that Bronze. Since then, our city hired a full-time bicycle and pedestrian coordinator, a huge commitment for a relatively small government. With the help of a local health researcher, we ran our first bicycle count last year and ran another this year. Even though we didn’t announce the count this year, we still saw a substantial increase in the number of riders. The city has been increasing the number of signs, bike lanes, and sharrows on the streets. The Rockville Bike Advisory Committee has upped its efforts as well. We’ve increased the number and publicity of our neighborhood rides, put on a few bike rodeos, participated in more community events, and ran a safety campaign. Beyond receiving the award itself, it was great to see the Mayor and City Council recognize it. It was time they set aside to illustrate that bicycling is important in our community, as both a mode of transportation and recreational option. They were proud of us, and it showed. The representative from the League is speaking while a city council member holds our new shiny sign. However, we still have a lot of work ahead of us. I don’t know that we’ll ever reach a Platinum (our 13 square miles don’t leave a space for single-track mountain bike trails), but I believe we can earn a Silver and maybe even Gold. Our neighbors in Arlington have earned Gold and there’s no way we can let Virginia get the better of us. The best way to get ahead is to follow what the League calls “the Five Es” – engineering, education, encouragement, enforcement, and evaluation and planning. While we’ve made great strides on street improvements and establishing parallel trails where necessary, there are still a number of multi-lane roads that are bike unfriendly. In particular, we’ll have a huge improvement in our infrastructure once Rockville Pike is redesigned to include the proposed cycletrack. Unfortunately, that may take a decade or so. In the meantime, we can support more bicycle friendly businesses, find new ways to attract people to community rides, and continue education for our youngest cyclists. 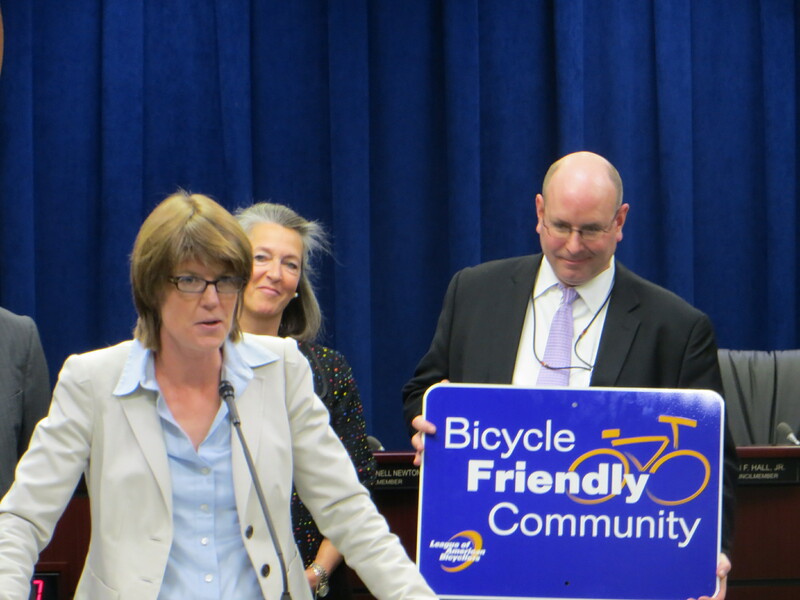 And when we finally join the D.C. bikeshare system this spring with the help of a federal workforce development grant that offers discounted memberships, those bikes will help encourage cycling for people of all incomes. So I’m happy that we’ve earned Bronze as a Bicycle Friendly Community. But we’re definitely eying those higher steps on the podium for next time! Is your city a Bicycle Friendly Community? Do you think it deserves to be? This entry was posted in activism, biking, community, Rockville, Transition Towns and tagged Bicycle Friendly Community, Five Es, League of American Bicyclists, rockville bicycle advisory committee. Bookmark the permalink.